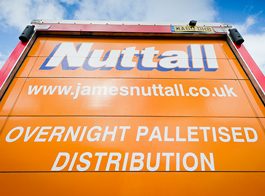 James Nuttall are proud to be members of the Palletline network, the UK and Europe's leading member owned pallet network. James Nuttall can provide a fully traceable next day service through our cost effective solution to those just-in-time problems! Unlike most other pallet networks, Palletline is owned by its members with everyone taking equal interest and responsibility for the business, creating an unrivalled commitment to quality and service, with clear advantages to customers across all market sectors. All this is underpinned by Palletline's world class hub, where cutting edge technology gives customers unrivalled service quality, fast deliveries and complete flexibility to distribute small consignments as well as larger loads.